Caulophyllum thalictroides, blue cohosh a species of Caulophyllum (family Berberidaceae), also called squaw root or papoose root, is a flowering plant in the Berberidaceae (barberry) family. It is a medium-tall perennial with blue berry-like fruits and bluish-green foliage. Blue cohosh has a profound normalising effect on the uterus, stemming excessive menstruation or bringing on a delayed menstrual period, as need dictates. The herb will promote regular menstrual discharge while lessening the severity of cramping. 1 oz. (28 g) of root to 1 pint (500 ml) of boiling water, macerated for 1/2 hour. Dose, 2-4 fluid ounces (59-118 ml) three or four times a day. 3 oz. (85 g) of finely powdered root to 1 pint of alcohol (500 ml), allowed to soak for two weeks, then well shaken and filtered. Dose, 1/2 fluid drachm-2 fluid drachms (1.8 ml-7ml). 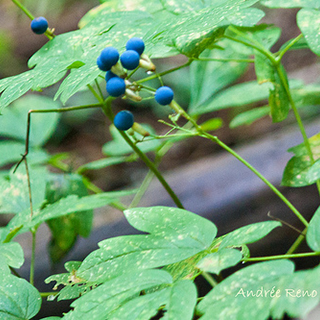 In foods, the roasted seeds of blue cohosh are used as a coffee substitute. This native prefers to grow in full shade conditions with a moist well drained soil. It does best if the winter's leaves were left around the plant come springtime. Propagate by seeds. Seed will need scarification prior to sowing. Collect the roots and rootstalks in the autumn.